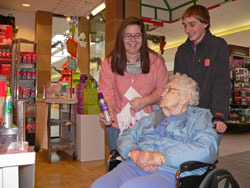 FULTON – Residents from Michaud Residential Health Services in Fulton made a trip to the Great Northern Mall for some holiday shopping and were joined by students from Phoenix High School. Pictured (left to right) is Michaud resident Annetta Noyes; as she contemplates a holiday gift purchase with some friendly advice being offered by Phoenix High School students Mckinzi Hess and Noah Neverette. The students joined folks from Michaud Residential Health Services for some holiday shopping and camaraderie while visiting The Great Northern Mall in Clay. Students who took part in the shopping trip are part of the Phoenix High School Spirit Club. The holiday shopping trip to the Mall is one of many scheduled outing and activities Michaud residents are able to take advantage of throughout the year. 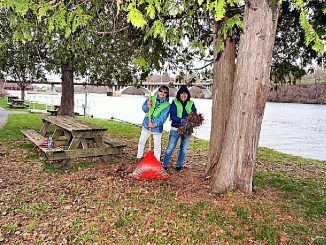 Entertainers, educational programs and partnerships with many area groups are all designed to keep residents active and engaged with their community.